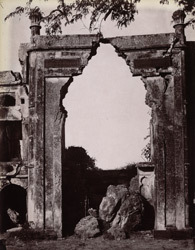 Photograph of the gateway of an unidentified ruined mosque, with a Persian inscription, at Khurmabad in the Shahabad District of Bihar in India, taken by Joseph David Beglar in the 1870s. The gateway comprises an arched opening in a rectangular frame that is rather larger than the walls to either side and topped by ornamental finials at either corner. The remains Persian inscription appear as a band of darker stone with the letters of the Arabic script carved in low relief.